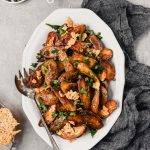 These roast fingerling potatoes are crispy on the outside and incredibly creamy on the inside. Tossed with capers and frico (cheese crisps), this simple side dish is easy to make and absolutely delicious. Heat oven to 425°F with racks set to upper middle and lower-middle position, set a baking sheet on lower-middle rack. Line a separate baking sheet with parchment paper. Add potatoes and 1 teaspoon salt to a large pot; cover with 1-inch of water. Bring potatoes to a boil over high heat and cook 5 minutes until a paring knife inserts with resistance in the middle. Drain potatoes well then toss with 2 tablespoons oil and 3/4 teaspoon salt. Working quickly, remove baking sheet from oven, drizzle remaining tablespoon oil on sheet then arrange potatoes cut side down in an even layer on baking sheet. Roast potatoes on lower-middle rack until deep golden brown, 45 minutes, rotating pan halfway through roasting. Meanwhile, combine Parmesan, ground fennels, and ⅛ black pepper. Spoon Parmesan mixture by rounded tablespoon onto parchment-lined baking sheet in mounds set 2 inches apart. Transfer baking sheet to upper-middle rack and bake until golden brown, bubbly and starting to appear dry, 7–9 minutes. Transfer baking sheet to a wire rack; let frico cool 5 minutes, then transfer to a wire rack to cool completely; break into bite-sized pieces and set aside. Flip potatoes over, and continue to roast until very crispy, 10–15 minutes longer. Let potatoes cool 5 minutes on baking sheet then transfer to serving bowl and gently toss with parsley, capers, and frico pieces.